The Fisher full-time MBA program is an in-person, two-year program that includes 25.5 credit hours of integrated core coursework, 7.5 credit hours of experiential learning (Business Lab Project, Social Impact Challenge, Optional Global Applied Project), and 27 credit hours of elective coursework. The program requires a minimum of 60 credit hours to graduate. Fisher’s revolutionized FTMBA program offers students an experience that is more personalized, experiential, and integrated than ever. Enriched with skills assessments, individualized coaching and hands-on opportunities to put theory into practice, the redesigned FTMBA cultivates career competencies that are highly sought by employers today. The FTMBA program utilizes student assessments to tailor an individualized experience that maximizes growth while addressing students’ professional needs. Each student has access to a team dedicated to their success: a conventional academic advisor, a career consultant, a mentor and a professional development coach. The comprehensive support team provides continuous feedback throughout the MBA journey. The program’s coaching and assessment components are major differentiators among MBA offerings. Students will undergo an assessment at the beginning of their MBA experience to identify their strengths and skills gaps. The students’ journey will be tailored so they can build on these strengths, close the gaps and earn an MBA that fits them and distinguishes them in the marketplace. The revamped curriculum—led by experts from a variety of core disciplines—incorporates immersive, cross-functional projects for top companies and organizations locally and globally. Unique program elements such as the Global Applied Projects, Business Lab Project and the Core Capstone Experience provide MBA students with opportunities to apply insights learned in the classroom, shape business through consulting projects, and maximize social impact. 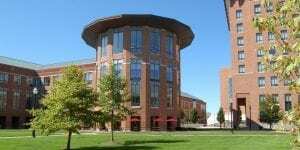 There are, in total, 185 students in the Fisher College of Business full-time MBA program, with 94 in their first year and 91 in their second year. They are, on average, 29-years old, 68 percent male, 32 percent female, 29 percent international, and 12 percent underrepresented minorities. The average GMAT is 676 (600–740 80th percentile range), and GPA is 3.44. Students enroll with 5.4 years of previous professional work experience. The Fisher full-time MBA class of 2017 reported a 94.4 percent employment rate within three months of graduation, with 80 percent employed by graduation. The average base salary was $96,034 and the average signing bonus, among those eligible, was $19,163. The current tuition cost of the full-time MBA is $53,642 for non-Ohio residents per year, and $31,139 for Ohio residents. More tuition information can be found here. October 15: On-campus travel stipend deadline: Applicants, with a submitted application, can receive a travel stipend up to $500.00. November 15: University Fellowship and Graduate Enrichment Fellowship deadline. December 15: Recommended deadline for those seeking an MBA Graduate Assistantship position. January 15: Deadline for eligibility to attend Red Carpet Weekend. March 15: Deadline for eligibility to attend Fisher’s Spring Interview Day—invite only. April 15: International Students: Final application deadline for admissions consideration. May 15: Domestic Students: Final application deadline for admissions consideration.